Until the discovery of the Americas, Finisterre was the last outpost of the known world. (The name translates, literally, to the ‘end of the world’). Today’s route pre-dates Christianity, as pagans would head to Fisterra on the Costa da Morte (Coast of Death) where they believed the sun died and the worlds of the dead and the living became closer. Prayers would be said and offerings made to please the gods. century. Facing it was a hospice for pilgrims that was founded by the parish priest Alonso García in 1469. 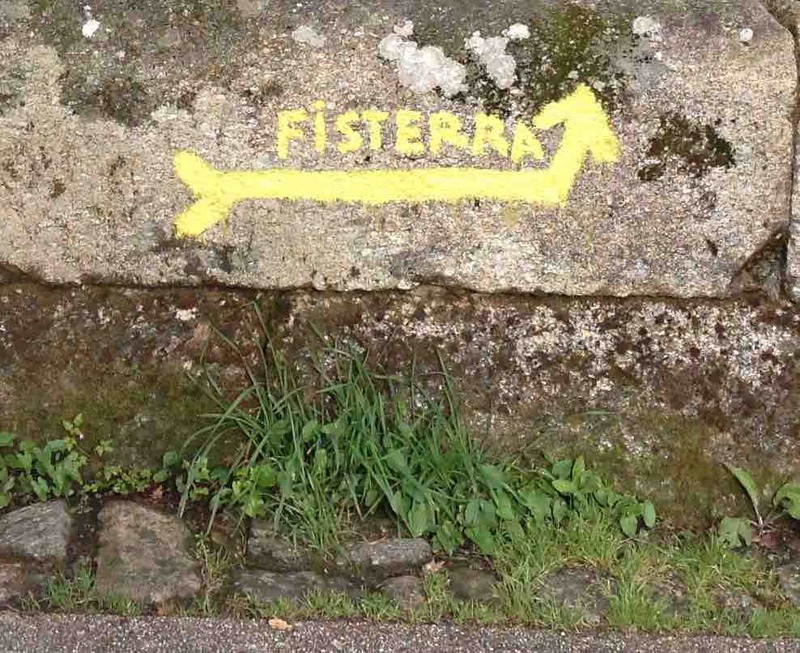 In ancient times, Finisterre was the end of the Camino. Today, whilst many pilgrims add a trip to Finisterre on to their Camino, the majority do this by bus and only for the day.We had been told by our neighbours, regular walkers on the various Caminos, that the route from Santiago to Finisterre was very beautiful and well worth walking. This it proved to be.We poured over guidebooks and decided the normal way of taking two or three days to walk the route was not going to work for us. We wanted to walk less distance each day and spend more time enjoying the Camino. This was proving difficult as there is much less accommodation along this route than along the Camino Francés. We also wished to continue staying in hotels or pensions, rather than hostels or albergues. We ended up booking accommodation some way off the Camino, which, in the event, turned out not to be a problem. Hotels, it seemed, were willing to collect and drop off pilgrims or failing that, arrange for a taxi to meet them en route. Problem solved. We decided to walk to Finisterre over five days, including two days when we would walk 22 and 21kms. ‘Have we got time to train for the walk…..?’ ‘No, not at all!’ You would have thought we would have learned from our last effort! The beginning of May 2015 once again saw the three of us setting off for Spain. As the last time, we broke our road journey by staying in the same hotel in Usurbil, near San Sebastian. An uneventful day, except Jackie, on our arrival, found that her passport was covered in sun cream! Understandably, the hotel owner decided he didn’t need to take a photocopy of it! As a side note, if you are ever travelling down the A64 autoroute, visit the Aire d'Hastingues on this French motorway where you will find a small but very good exhibition on the Camino. Three French routes meet close to this point – la Voie du Puy, la Voie de Vezelay and la Voie de Tours. We came across the exhibition by accident this time around. Next day dawned and onwards to Santiago de Compostela. Not long after leaving the hotel, the rain fell down in sheets. Never mind, this happened last time around and we saw sun for the whole walk. After another uneventful day, we arrived during rush hour in Santiago. This time we had chosen a small hotel in one of the main pedestrian streets close to the Pilgrim Office, as it was both central and close to the Cathedral and restaurants. But we had to find it first! After a few false turns we found the underground car park recommended by the hotel (we purchased a week’s ticket) and left the car in a section manned by security guards – perfect! We must have looked a sight, dragging cases and daypacks around the outside of the cathedral (thought about a short cut through the building but decided not a good plan) and into the hotel foyer. That evening we had tapas in a suitable eatery close by. It was strange once again to be eating amongst pilgrims and bringing back positive memories of our last pilgrimage. Pilgrims were exchanging contact details, promising to keep in touch. Friendships made en route to last many months/years - no idea. Leaving the restaurant we encountered a cold wind which did nothing to encourage us to hang around outside. Warm beds called, as we were to be up early the next day. Leaving our main bags behind for onward carriage to our next hotel (€5/day this time) and having consumed a good breakfast, we headed out, down the side of the Cathedral, following an intermittently signposted trail which led out of the city. After crossing over the ring road and entering a small park, amazingly the noise and bustle of Santiago disappeared, being replaced by bird song. for refreshments that we had an opportunity to talk with fellow pilgrims. Day one’s walk took us through a better-off suburb of Santiago with its big houses and well-tended gardens and out into the agricultural Galician countryside. Our feet that day saw tarmac, hard tracks and soft mud. We crossed several streams and large rivers and climbed some big hills. En route we saw old houses covered with the scallop shells, the symbol of the pilgrim of Saint James, farm houses which had not changed for a long time and people working the countryside using methods which would not have been out of place 100 years ago. Mixed amongst these were modern farmers with all the equipment one could want. A strange blend of old and new. Today the sun shone and the temperature was perfect for walking. We were heading for the first refreshment stop, which, if we kept up a good pace, would get us there around lunchtime and so it proved to be. It was the village café with a limited menu. A sandwich or a sandwich! ‘OK, we will take a sandwich’, which turned out to be half a loaf washed down with a hot drink. However, views across the countryside more than compensated for the energy consumed. Then there were other rewards, such as the old mill and bridge at Maceira and the cold beer when we reached Negreira. We were staying at a small pension just outside Negreira and the arrangement was for us to call the pension when we arrived in Negreira, which we duly did. Just as the last of the beer slipped down, the owner arrived, bundled us into his car and drove us to his pension. On arrival, we were offered a drink from a large well-stocked fridge – ‘If you want more, help yourself – there is no charge’ - and then asked where we wanted to go to eat, as the pension had no restaurant. ‘Close by’ we said. No problem and he quickly recommended two places. At the appointed time, we climbed back into his car and were driven back into town. We staggered into the first of the two recommendations (it was the closest) to experience an amazing home-cooked three-course meal for €8. It later turned out that the couple running this restaurant were English/Spanish from North Devon! When we had finished our meal, they phoned the pension and we were collected. Soon afterwards we were turning out the lights. Sleep came very quickly. We did walk the 22kms but the killer, as always, was the up and down hill. Wish we had trained harder! After yesterday, we were hoping for an easier walk but first we needed to get through the breakfast feast and what a feast it was! Homemade breads, cakes, fresh orange juice, fruit and fresh eggs. Bags packed and bills settled, once again we piled into the owner’s car for a ride back to the Camino (via a bank, to withdraw some money). Our stay at this pension was remarkable value, especially so as no charge was made for the car rides. tracks, farm tracks and quiet roads. As on most days, we were to cross small streams, mostly using interesting bridges, and to encounter reminders of the ancient trail and of pilgrims who had gone before us, mainly in the form of old churches and monuments to the pilgrim. 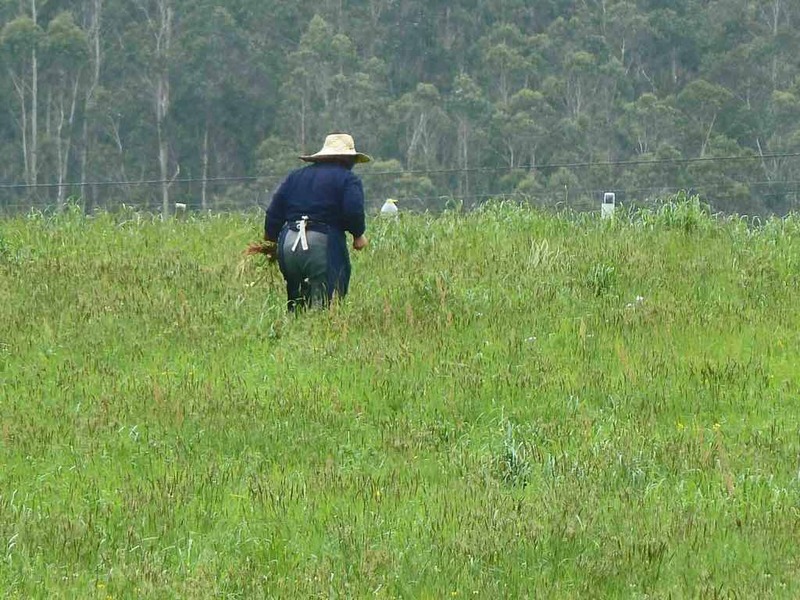 Life in the fields seemed unchanged, we saw an elderly woman harvesting her crops in a fashion which would not have been out of place in Asia, with her wide brimmed hat, hand tools and a tall crop in a wet field. rain was forecast. We looked up the forecast on our smartphone – no sign of rain there. One hour later, it started. Taking refuge in a bus shelter, waiting to see if it was blowing over, a German pilgrim walking from Finisterre to Santiago stopped and spoke with us. It seems more difficult to walk a reverse route, as the signs were few and infrequent! We all reluctantly concluded that we would have to walk in the rain and thus departed, with him heading for Santiago and us for Finisterre. Its amazing how much one’s visibility and general cognisance of the immediate environment changes when wearing a cagoule! The noise of the rain bouncing on your head severely reduced conversations between the three of us as we trudged slowly ever onward. The bonus was that we were still walking through beautiful GREEN (I wonder why) countryside and the occasional hamlet. At around 5.00 in the afternoon, we approached the point where we had agreed to wait for our taxi. It was an old run-down farm with a modern albergue. We asked the old couple running it if we could wait for a taxi here. ‘No problem and you can stay here if you wish.’ We politely declined but sampled some warming homemade hot chocolate. The guidebook was close in it's estimate of distance to be walked. Our hotel for the next two nights was situated beside a lake, although we wouldn’t have known it, as, on arrival, it was obscured by rain and fog. The wood fire, bath and bed were very welcome that night, as was the amazing food we were to sample over the next couple of days. It was really a family-run restaurant with rooms attached. The son was the chef but his mum cooked on his day off. The daughter-in–law ran the restaurant/hotel and waited at table. Their perfect English was the result of living and working in London for some years and the ambiance was just perfect. One advantage about walking long distances is that you don’t have to worry about what you eat and drink. We made full use of this! Pulling back the curtains in the morning revealed it had rained through the night and was still falling, though as drizzle. After breakfast, a taxi took us back to the Camino for a long day’s walk in the rain. Day 3 saw the countryside changing from agricultural to moorland which continued up to the coast. Yet again we crossed several rivers fed by the rain from above. We stopped in several cafés to dry out, watching our fellow drowned pilgrims either march on by or sensibly, like us, stock up on warm drinks. Health and safety has never been an idea to catch on in southern Europe, confirmed by the fact we watched two ‘farmers’, one of whom was standing in the bucket of a JCB power-washing a building, whilst the other manoeuvred the vehicle according to hand signals, trailing an electric cable! All of this on a public road! Just past Olveiroa, the terrain changes from pastoral land to open moorland. it was here when the wind blew up and the rain came down with a vengeance. Great feeling to be out in the open with no shelter at this point! It did cause us to pick up pace though! Lunch was late that day and was taken in one of the albergues along the route located in a small hamlet. Like all the places in which we ate, the food was home cooked, based on local dishes, freshly prepared and great value. Most other pilgrims sensibly decided that this was a good place to stop for the night. We, on the other hand, had more kilometres to do before calling the hotel for a lift but at least the rain now stayed away. picked us up in his car, apologising for the fact that the day before we had had to get a taxi. However it had been his day off, otherwise he would have collected us. We arrived back cold, wet and tired but tea and cake on arrival in front of a real fire soon warmed the cockles of our hearts! The sun was out for today’s walk, which the guidebooks said would be easier than the last two days and so it turned out to be. We were to be walking across open moorland before a short climb and a long descent to the sea. The only concern was that there are no places to obtain refreshments before reaching the coast, some 15kms away. With a picnic prepared by the hotel and enough water to see us through the walk, we set off once again, having been dropped off by the son from the hotel. Perhaps it was because it was the weekend but a lot more people were walking today, including some families. During the later part of the day’s walking we even saw organised groups walking the last 25kms to Finisterre (over two days). The landscape was now entirely moorland. Although the trail was well marked, so the chances of getting lost were remote, we were to pass through no habitation for the whole day until reaching Cee. in the demeanour of our fellow pilgrims, who today had time to stop and talk to each other. We stopped for lunch in the grounds of an old chapel where picnic benches had been set out for the pilgrims. Close by was a small clear running stream and a farm in the distance. Pilgrims, mainly in their teens or late 20’s from America, Asia and Europe were sitting in the sunshine enjoying the camaraderie brought about by the Camino. We felt positively ancient but we were doing the same walk as them, even if at a slower pace! After lunch we set off and soon the trail began to climb once again. Just as we were remarking ‘wouldn’t it be nice to have somewhere to stop for a drink?’, we came across a ‘pop-up’ stall alongside the Camino, miles from anywhere. Of course we stopped and starting speaking with the person running the stall. His story was one we had heard before. 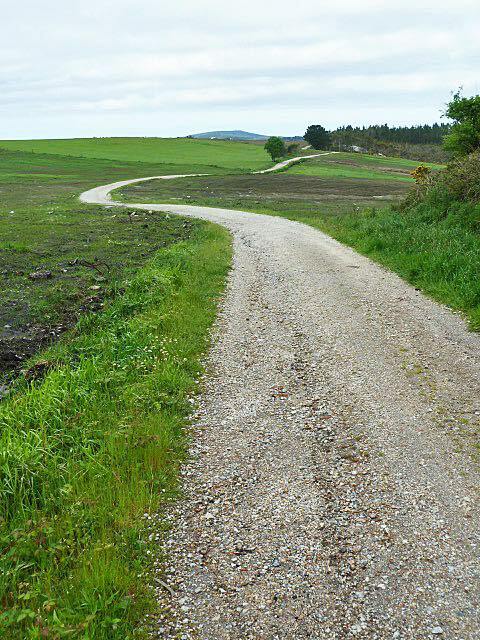 He had walked the Camino the previous year to rid himself of drugs and his previous lifestyle and, since then, his life had been turned around. 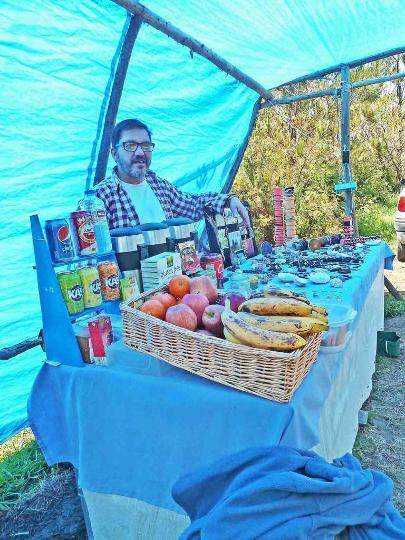 He now lived frugally, making a living selling from this ‘pop-up’ shack. The local albergue allowed him to wash free of charge and stored his stock. The local community helped him whenever he needed it and he had a new friend, a young puppy. We asked how much we owed him. ‘Just give me a donation of whatever you want.’ Sometimes you just don’t realise how much you have, either from the point of view of a stable family and circle of friends or from a pure monetary perspective. We stopped just where the coast came into view for a rest and to let the air get to our feet, whilst enjoying a fantastic panorama which included our finish point, Finisterre. The path now descended steeply downwards for some 3km. Down we went, avoiding speeding mountain bikers (don’t think they were pilgrims), and into Cee, an industrial port next to Corcubión. Did I see an ice cream sign? Time for today’s first indulgence. Our pension for the night was not far away in Corcubión. Unlike the day before, we arrived reasonably refreshed. Our rooms had views of the sea and there was a large terrace. ‘Could we have a drink on the terrace?’ we asked. ‘No problem’ and shortly afterwards a bottle of white wine and some olives arrived, at a price that we could afford! restaurant serving tapas. It was to be enjoyed alongside locals watched Spanish football. The atmosphere was not silent, especially as they supported opposite teams! The ladies behind the bar were used to it though and just rolled their eyes every so often at the antics of the men! We had walked a little more than the 17kms the guidebook said we would do that day, but it was a good day. And, as Zebedee use to say – time for bed! Finisterre here we come. Today was to be the shortest day but our feet were complaining, so it was not going to be a walk in the park. Leaving the pension around 9.00, we retraced our route through the town (an old fishing port), past the church and began a very steep and longclimb out of town along a track that was first a streambed and then a tarmac path before turning into a road. Climbing ever higher, we had views of the town and port, as well as the trail we had walked the day before. Benches to rest upon lined the hill as we climbed slowly upwards. To our mind, the immediate area had more than a whiff of Cornwall to it, small bays - some only accessible by boat, fishing ports with rocky cliffs and narrow roads. he day’s walk basically followed the coastline after a short cut across one of the promontories and, as during all our days’ walking, there were hills to climb and descend. We stopped for coffee at a hotel with its own private beach (a spot of luxury and great loos! ), then later at a small bar for lunch, again next to a different beach, before wandering along a cliff top path and descending on to the 2.5kms beach which leads into Finisterre. 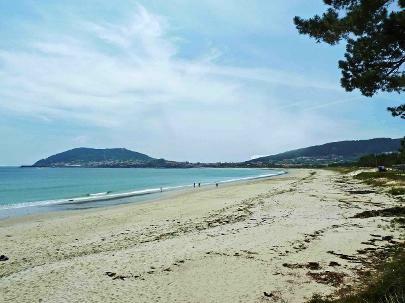 Our hotel was situated behind this beach and so we took the opportunity to drop our daypacks before walking into Finisterre and to the end of our Camino this time around. Complete with our pilgrim passports, we proudly walked into the official albergue in Finisterre to claim our certificates. The albergue is run by a family on behalf of the Spanish Society of St. Jacques. ‘Do you have your passport?’ we were asked. ‘Yes here it is’. ‘No, your official passport, your ID.’ ‘No, I left that in the hotel’. ‘Can you remember your passport number?’ ‘I think it is …..’ trying to remember the number. ‘Fine, here is your certificate!’ We were now the proud recipients of our certificates to confirm we had walked from Santiago to Finisterre. 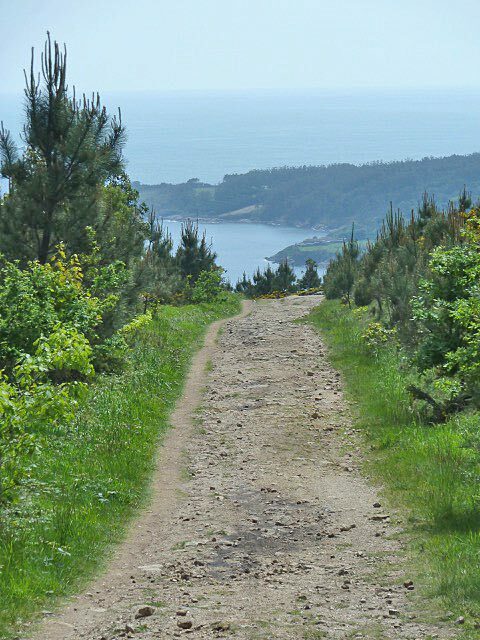 In a discussion with the family, we found that in the last few years, the number of pilgrims walking to Finisterre during each of the summer months equals the number who used to walk it each year a little while back. This can be seen in the new facilities being built along the route. After a quick walk around Finisterre, (no we were not going to shed our clothes and boots, throwing them into the sea. It was too cold for that, although Andy’s boots would walk no more, the sole had come adrift!) we headed back to the hotel to reflect on this part of the Camino. To the end of the world is around 3.5kms from the albergue, making the day's walk closer to 19kms. That evening we ate in Finisterre. When we finished around 10.30, we asked if there was a taxi around, even though the hotel had offered to collect us. ‘Yes, the rank is just outside.’ On going downstairs, there were no taxis to be seen. A few minutes later, the restaurant owner came out, told us to get in his car and brought us back to our hotel for no charge. Yes, they knew we were pilgrims and no, we didn’t spend a fortune in the restaurant. It was typical of the kindness we experienced throughout Galicia. En route back home, we stopped overnight in Léon. Andy decided to explore whilst others slept. ‘Do I need a map? No, I’m only going to walk down a couple of streets.’ Yes he did get a bit lost but a local, seeing the scallop shell on his daypack, asked if he needed directions and then accompanied him back to the hotel. Ironic really - walked the Camino without getting lost and then gets lost a kilometre from his hotel! The taxi from Finisterre back to Santiago was a good choice for us, the cost being split three ways, and ensured we were back in time for us to arrive in Léon by late afternoon. Other options are the long distance buses, which are cheaper but take a longer time and don’t drop you where you need to be! The car was waiting for us, undamaged and raring to go. What did we gain from walking the Camino? It is an interesting question. 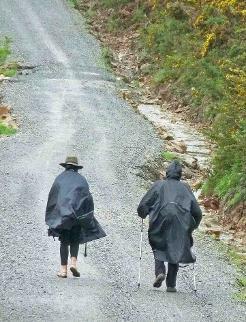 Walking the Camino granted us access to the camaraderie of fellow pilgrims who journeyed from across the world to take part in an event which has continued for many centuries. We were also lucky enough to see a beautiful, unspoilt part of Spain but, more importantly, to experience something which does not totally rely on the comforts of the modern world. Walking, as opposed to driving, provides a wholly different perspective on the countryside and the people who live in it. We gained greatly from being able to talk to people of all nationalities, ages, creeds and religions. This, we feel in retrospect, has led us to an even greater sense of acceptance of others, of their differences, of their problems. We were overcome by the generosity of the locals in Galicia. They went out of their way to help us. Every day we saw examples of this. Even if we went into a bar for a drink and a loo stop, we were more often than not given a plate of tapas, free. The owners of pensions and bed and breakfasts gave us small gifts too, one gave us each a small replica of the shell of Saint James. They continually offered to drive us wherever we needed to go, though how they had time for this we have no idea. When meeting people who are walking for a reason, one finds that everyone has their struggles and demons in life, that everyone has their own cross to bear and that other people’s problems are always greater than one’s own. Not everyone will tell you why he or she is walking the Camino. Some set off with a particular reason in mind but that reason may change during, or after, the walk. Some realise that the original reason was not the real reason at all. We met people whose spouses or children were ill and they were walking in the belief that they would be cured. Some were walking (yes, walking) because they themselves had had an accident or were unwell. We met pilgrims who had been in a very bad place and who hoped to change their lives through walking the Camino. Then there were people walking in memory of a relative or friend who had died. We met many Americans and Australians walking the Camino because they had seen the film, The Way, and thought it would be a great thing to do. 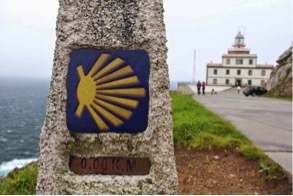 Some walk for religious reasons, some do not but most would say, after completing the Camino, that it had been a spiritual experience of some kind. There are those who certainly experience a spiritual encounter whilst walking the Camino, religious or otherwise. Certainly for everyone, the walk, often in solitude, provides a rare opportunity to take stock of all that is important in one’s life, being isolated from the normal, everyday routine - time perhaps to reorientate oneself, to reprioritise one’s life. 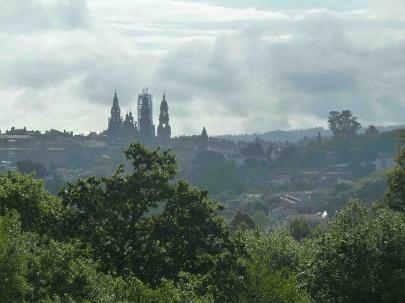 It is said that walking the Camino is just the beginning. It is when you return home after the Camino that your life starts to change. That is true for us and for many others who have walked all or part of the Camino. But it takes time for one to realise it.